Humans tend to perceive climate as a force of nature, one to be measured, classified, and ultimately conquered. John Steinbeck's quote speaks to another human characteristic: the tendency to forget. This seems especially true when it comes to the periods of wet and dry over the past century or so in the American West. Perhaps, however, we can be sympathetic to this tendency when we realize that to "measure the climate" at any given point is really a measurement of the current weather. To understand complex climatic patterns requires a much longer timescale. Thus, in our lifetimes, we experience only a small sampling of climate effects-not the full range-in the West. Imagine a performance of a Beethoven symphony with only the first chords, played over and over again. If that were all we heard of the symphony, we would believe it was beautiful-but simple. We could hum along and predict what would come after the initial chord sequence. However, as we know, Beethoven wrote complex and intricate symphonies, often full of surprises. These may be pleasurable in musical compositions, but surprises in climate can have catastrophic results for societies. We can remove the element of surprise by understanding as much about our climate as possible. 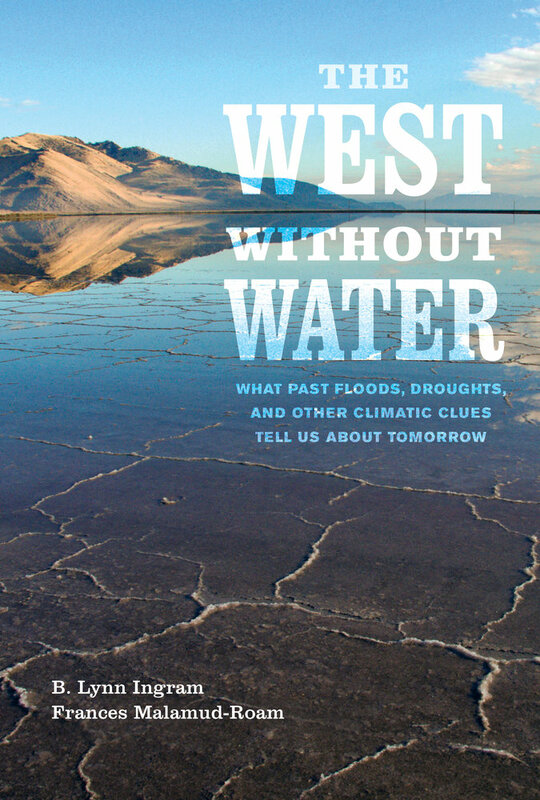 In this book, we focus primarily on those aspects of climate that have an impact on water resources in the West. To further our understanding of those resources, imagine "flying over" North America using Google Earth. Traveling from east to west, we see obvious contrasts: shades of green that dominate the eastern portion of the country abruptly give way to vast areas of brown, tan, and yellow. The color contrasts are due, of course, to moisture differences. The humid east supports more forests and, moving westward, wide prairies. Western North American is more constrained by water availability, especially in the southwestern deserts. If we zoom in a bit closer and fly across this western region from west to east, we begin to see a relationship between the lay of the land and the colors of the land-a relationship that is largely based on water. Passing above the Pacific coast, we observe mountains, especially along the northern coastline, with lush rainforests that give way quickly to grasslands and then to deserts. Within this region, it is clear where the water falls: the Pacific Northwest and Northern California appear deep green, as does the central and southern Sierra Nevada mountain range (see figure 2). Much of Southern California and the states of Nevada, Utah, Arizona, and New Mexico appear in varying shades of brown, tan, and red, reflecting the vegetation and the composition of the soils-both related in large part to the lower amounts of rain and snow that fall there each year (see figure 3). Precipitation over the American West is spatially irregular because it depends on the complex behavior of the Pacific Ocean and its exchange of water and energy with the atmosphere. The atmosphere receives moisture from the ocean through the process of evaporation, and some of that moisture is eventually carried away from the ocean and delivered on the continent as rain or snow. Just how and when that evaporated seawater drops as rain or snow over the West depends on the patterns of ocean currents and atmospheric winds and on the interaction of moisture-laden air with the landscape as it advances inland. Weather satellite images of the West Coast vividly show the movement of the atmosphere over the Pacific Ocean: large, counterclockwise swirls of white, moisture-laden air that drift toward the coast and finally over the land. The topography of this region, especially the high mountain ranges, disrupts this flow of air, forcing it to rise up the slopes. As the air moves to higher altitudes, the moisture condenses, because rising cooling air cannot hold as much water vapor. The major mountain chains of the West-the Cascades in the northwest, the Sierra Nevada in California, and the Rockies farther east-are oriented north-to-south or northwest-to-southeast, which are the ideal orientations for intercepting the Pacific winter storms that flow from west to east. As these storms are forced up and over these mountain chains, much of the moisture is wrung out on the windward slopes, leaving the leeward slopes and places to the east relatively dry (see figure 4). This explains the relatively lush western slopes of the mountains in the West compared to the drier and sparsely vegetated eastern slopes and valleys beyond (see figure 5). In this way, the landscapes of the American West both have an influence on the region's weather and are formed by it. California spans nearly ten degrees of latitude, which results in a wide spectrum of natural plant communities, determined largely by the rainfall regime. Storm systems entering California first encounter the Coast Ranges and then pass through the Central Valley, move up the high mountain ranges of the Sierra Nevada, and continue into the deserts of the Great Basin. Northern California is the southern extension of the lush temperate rainforests of the Pacific Northwest, whereas Southern California is part of the deserts of the semiarid to arid Southwest. Nevertheless, California's moisture regime follows strict-if somewhat unusual-patterns. The Department of Geography at the University of California, Berkeley, has a long history of researchers interested in climate, including Jim Parsons, who, in a personal communication with this book's authors, noted that the state's climate is unique because of its arbitrarily conceived boundaries, which outline the only area of winter rain and summer drought in North America. This so-called Mediterranean climate-warm, dry summers and mild, wet winters-is a common occurrence on the west coasts of continents at about 35 degrees latitude. During the summer months, the atmosphere over California is dominated by the Pacific High, an area of warm, dry air that prevents storms from entering the state. Thus, California's climate is characterized by two main seasons: one wet, the other dry. As described above, Pacific storms in the winter drop much of their rain and snow along the western mountain slopes, concentrated in a relatively short wet season. In fact, California has the highest year-to-year variability in precipitation of all the western states. This variability is the result of a relatively small number of Pacific storms-on average five or six-that enter the state between the late fall and early spring. California's precarious water situation is apparent in the fact that a shortfall of just one or two major storms can mean the difference between a "normal" water year and a dry year. As a result, water management is particularly challenging in this state. In addition to the year-to-year variations in precipitation, of course, California's climate changes on longer timescales, from decade to decade, century to century, and millennium to millennium. The patterns of these longer-term variations are discussed in more detail later in this book. In the higher mountain elevations of the West, precipitation often falls as snow. This snow provides a crucial amount of water, filling streams, lakes, and reservoirs to be tapped during the long, dry summer. Across the West, the melting of the winter snowpack provides a significant proportion-50 to 80 percent-of the annual water supply for ecosystems as well as human consumption. Water managers throughout the West rely on early forecasts of snowpack to plan for each water year. These forecasts are based on measurements of the mountain snowpack, obtained by hardy snow surveyors who head out on skis into the mountains to determine how much melt water will be available in the coming year. Each year in California, over 300 snow courses are checked, each 1,000 or more feet long with measurements made every 100 feet on average. The practice has been a part of the state's water management program since the early 1900s, and the data collected provide valuable planning information for farmers, utility companies, municipal water managers, and flood control managers. During the 1950s, 1960s, and early 1970s, another researcher in the U.C. Berkeley Department of Geography, Douglas Powell, spent his winters on skis taking part in the annual state snow surveys. Clear, sunny fall days may be welcome to most Californians, but Powell was always happier when the storm clouds arrived early, heralding a wet year that would replenish the state's water supplies. He would often remind his summer-session students, with a hint of wistful optimism, that storms-even thunderstorms-could arrive as early as September. Moreover, autumn blizzards in the Sierra Nevada Range are not unheard of: in 1846, a series of October blizzards dropped ten feet of snow, trapping the Donner Party during their ill-fated trek across the Sierra. Few of Powell's colleagues or students (this book's authors among them) have experienced the linkages between landscape and climate as intimately as he did. For several weeks each year, he and his team strapped on cross-country skis and backpacks loaded with log and field notebooks, pens, and special snow collection tubes to determine the depth, water content, and density of the snow he would trek across each day. They would measure the water content of the snow by filling a special tube with snow, weighing it, and weighing the empty tube. One ounce of snow translates into one inch of water content of the snow, so the snowpack can be converted into the amount of water that will be generated when that water melts (see figure 6). Powell could think of no better way to spend his winter months than in the high Sierra Nevada, measuring the precious gift that the mountains held in reserve for the long, dry summer and fall months of the West. Snow surveyors are still important today, but, since 1977, a considerable amount of data is collected by a network of instruments that have been installed across the mountains of the West to forecast water supply. These instruments automatically transmit the snow and climate information they measure to a centralized computer system by radio telemetry. Changes in daily snowpack are monitored, along with temperature, precipitation, stream flow, reservoir and groundwater levels, and soil moisture-all part of an early warning system for floods and droughts in the western United States. As we will discuss further in chapter 13, studies of changes in the snowpack over the past century reveal that the average snowpack has steadily decreased by about 10 percent over that period, most likely due to warmer temperatures. Climate modeling predicts that, by the end of the twenty-first century, the snowpack could shrink by another 40 to 80 percent. Scientists began closely monitoring the West's climate after the nineteenth century, recording the region's weather variables: temperature, atmospheric pressure, precipitation, and wind speed and direction. These measurements provided monthly and yearly averages, defining the region's climate. Climatologists have also examined extreme deviations from the mean in order to understand the causes of these deviations and perhaps learn how to predict them. The measuring and monitoring of climate over the past century has allowed climate scientists to assemble the pieces into a larger picture that begins to explain what drives climate, including the critical interactions between the Pacific Ocean and its overlying atmosphere. As geographically varied as the West is, climate in this region has been fairly consistent over the past 150 years and, by and large, suitable for human habitation. This period of time would seem to be long enough for us to know what to expect from our climate, both in normal years and in "extreme" years. However, as we shall see later in the book, this is not the case. Extreme events have struck every few decades over the past century and a half, some with catastrophic results. Even more extreme events have occurred with some regularity in the distant past, though the intervals between them often lasted a century or more. Understanding the causes of these events and how they affected the West in the past can help current residents anticipate the effects when such events recur in the future-which they surely will. On one end of the climate spectrum is drought, when the wet season fails partially or altogether. Nothing brings more fear to the hearts of water planners in the American West than drought. Droughts lack the visual and visceral images of other natural disasters; instead, they creep up on the landscape with no clear beginning or end. Meteorologists define drought rather vaguely as an abnormally long period of insufficient rainfall that adversely affects growing or living conditions. Such a bland definition belies the devastation wrought by these unique natural disasters. In human history, whole civilizations, even while at their peak, have toppled in the face of prolonged drought. For humans, drought means failed crops, desiccated landscapes, water rationing, decimated livestock, and, in severe cases, water wars, famine, and mass migration. For the more distant past, drought is defined in relative terms, such as when precipitation, runoff, and lake levels fall below the long-term average by at least one standard deviation, or when the growth rings of trees become narrower than average by a certain amount. In drought-prone regions, native plants and animals usually employ adaptations to survive through periods of lower than average precipitation; such adaptations have evolved over very long periods of time. Humans in the West today, in contrast, have flourished only by manipulating the natural hydrology using modern engineering and technology. The worst single year of drought in recorded history over much of the American West occurred during the winter of 1976-77. The drought was widespread, extending across the entire state of California and to the midwestern states and north into the Canadian prairie region north of Montana. Even the Pacific Northwest experienced its worst drought on record, leading to shortfalls in crop yields and region-wide water rationing. Record low flows were measured on the Columbia River, leading to restrictions on power consumption from hydroelectric plants. The snowpack in mountains from California to Colorado reached historic lows, and ski resorts from the Sierra Nevada to the Rockies remained closed for much of the season. The 1976-77 drought was particularly devastating in California. Precipitation levels that year dropped to less than half of the average level throughout the state (see figure 7). Northern California was especially hard-hit, with rainfall reaching only 15 percent of average in some regions. Runoff and river flow in California fell to a quarter of its normal level, and storage reservoirs saw dramatic declines, falling to about a third of their normal levels. In the Sierra Nevada, Lake Tahoe dropped below its outlet at the Truckee River (near Tahoe City), causing the Truckee River to cease flowing, which in turn caused Pyramid Lake in northwestern Nevada to drop as well. Aquatic habitats were severely affected, with the worst impacts in the lower to mid-elevations of the Coast Ranges and the western slope of the Sierra Nevada. Low river flows, combined with higher water temperatures, severely disrupted the migration and spawning of migratory fish species, including all species of salmon and trout. The shortage of surface water in the state prompted an increased use of groundwater for agriculture and cities. The proportion of groundwater used increased from 40 percent of the total amount of water consumed during a normal year to 53 percent, causing a precipitous drop in the water table throughout California. Particularly hard-hit was the southern Central Valley (the San Joaquin Valley), where the water table dropped so low (by up to fifty feet) that pumping capability could not keep up with demand from irrigated agriculture, and groundwater depletion was estimated to be five million acre-feet, or four times the annual average. Nine thousand water wells were deepened or drilled. In order to aid in water efficiency, many farmers shifted from growing rice and other water-intensive crops to grains, particularly barley, wheat, and oats. Well over seven and a half million trees died as a result of the 1976-77 drought. Some regions in the highest elevations of the Sierra Nevada lost three-fourths of their trees, including ponderosa and Jeffrey pines, red firs, and white firs. These trees, weakened by the lack of water, succumbed to insect-related diseases like bark beetle or to longer-term diseases such as mistletoe and root rot. Wildfires also claimed many trees. In August 1977 alone, lightning strikes sparked 1,400 wildfires in Northern and Central California forests. In Central California, the dry year meant record low freshwater flows to the Sacramento-San Joaquin Delta and San Francisco Bay, with cascading impacts on aquatic ecosystems. Water quality declined throughout the delta, where water is pumped and transported to Southern California, providing drinking water for twenty million Californians. With lower river flows, seawater penetrated upstream far into the delta, causing chloride concentrations to quadruple. In an effort to prevent this, water engineers released as much fresh water from the meager reservoir supplies upstream as possible and constructed temporary barriers in the delta. Nevertheless, severely reduced freshwater inflow raised the water salinity in the San Francisco Bay to record high levels, leading to a dramatic decline in the bay's phytoplankton, the base of the estuarine food chain. Fish populations in the estuary crashed as their primary food sources disappeared. In both the bay and the delta, decreased freshwater flows also increased the concentrations of pollutants, including pesticides drained from farm irrigation fields in the Central Valley. The effects of that extreme year spread like tentacles of pain deep into the ecosystems of the West. California's economy also suffered that year: in the Sierra Nevada, the sparse snowfall had severe impacts on the business of winter sports and the tourist industry. Ski resorts in Northern and Central California were particularly hard-hit. Some of these resorts never opened, and those that did were forced to close within a very short period. The summer recreation economy also suffered, since resorts on the state's rivers and reservoirs were affected by low water levels and forest closures. Many of those resorts closed, some declaring bankruptcy, as shorelines receded, rivers dried up, and boat launches and docks were left high and dry. Fishing, rafting, and other river activities were not possible as flows diminished to a trickle during the summer and fall of 1977. Forty-seven of California's fifty-eight counties declared states of emergencies, and severe water restrictions and mandatory rationing was imposed. In Southern California, the Metropolitan Water District was forced to increase imports from the Colorado River to near capacity. That summer, the Colorado River aqueduct supplied 85 percent of the water delivered to Los Angeles, Orange, Riverside, and San Diego counties. So desperate was the situation that the state considered increasingly far-fetched and elaborate schemes for getting more water, including importing water by pipeline or railroad from as far away as Alaska's Yukon River, or towing icebergs to the region from Antarctica. Cloud-seeding was tried in Northern California. Losses to California's economy eventually reached $2.6 billion. But there was a silver lining in all of this gloom. Due to the enormous economic costs, California and other states in the West became serious-for the first time-about water conservation. Low-flush toilets and other water conservation measures got their start. Industries realized that implementing water conservation measures would be the most effective way to meet future water shortages. For instance, the agriculture industry, which consumes 80 percent of California's fresh water resources, began implementing soil and water conservation practices. On the other end of the climate spectrum, an overabundance of precipitation and runoff in the West can also prove disastrous, causing massive flooding. Floods are common in the West; seldom has a decade passed free of these devastating events. During unusually wet years, rivers overtop their channels, inundating vast reaches of land that are typically dry and increasingly populated. The enormous power of a flood destroys everything in its path, leading to landslides and mudflows, washed-out roads and bridges, lost crops, lost homes, even lost lives. Worldwide, floods cause more deaths each year than any other natural disaster. Climatologists talk about droughts and floods as two sides of the same coin, because the worst floods in the West often followed on the heels of some of the most severe and prolonged droughts. In 1937-38, for instance, catastrophic floods hit California and other parts of the West, punctuating the end of the infamous Dust Bowl drought. The northern two-thirds of California suffered severe flooding in December 1937, with record flows on rivers draining the northern and central Sierra Nevada. Two strong Pacific storms dumped ten inches of rain in Southern California the following February and March, resulting in catastrophic flooding from San Diego to Los Angeles and into the Mojave Desert. Those floods killed 110 people and destroyed almost 6,000 homes. Next came severe mudslides, destroying all roads leading to the San Gabriel Mountains, stranding residents for days, including an elementary school class forced to climb on top of the cabinets in their classroom to get away from the rising muddy waters that covered their desks. Following a sleepless night listening to the roar of a small river, the children went outside in the morning to a scene of devastation: entire houses and the remains of houses were strewn haphazardly across the landscape. Farther downstream, the city of Anaheim lay beneath five feet of water, and residents had no choice but to spend the night on their rooftops. The unusually wet conditions of that winter of 1938 extended into southern Arizona, where precipitation was 74 percent above normal and the Gila, Salt, and Verde rivers all flooded their banks. This scenario was repeated two decades later when a period of drought in the 1950s was followed by massive floods in 1955. The central Sierra Nevada and southern San Francisco Bay region of California were particularly hard-hit. Record rainfall in December that year fell across the state, causing massive flows on Central Valley rivers. In Southern California, Orange County's biggest natural disaster occurred as warm rain melted snow in the San Bernardino Mountains, causing catastrophic flooding along the Santa Ana River. Once again a state of disaster was declared for all of California. Devastating floods are an inevitable characteristic of the climate in the West, a topic we will discuss in future chapters. Despite a century of elaborate engineering that has attempted to tame and control the flow of water in the region, floods continue to inundate the western United States with a frequency that seems to have increased. Yet the floods that have been witnessed and recorded in the West over the past 100 or so years represent a very small sampling of the deluges and floods that are an integral part of the region's hydrology. Climate researchers are finding increasing evidence for much larger events that have occurred with alarming regularity over the past several millennia. It must be borne in mind, however, that, despite their destructive potential, floods are a natural part of both the hydrologic and the ecological systems of the West. Floodwaters carry nutrients and organic material that are deposited onto the surrounding floodplains, producing fertile soils. These soils have made California one of the most important agricultural centers in the world, generating $30 billion per year. More than half of the fruits, nuts, and vegetables consumed in the United States are grown on some 87,500 farms in California's Central Valley. Nevertheless, residents in California and other regions of the American West continue to face risks from catastrophic flooding as they place themselves directly in the path of floodwaters, building their homes on floodplains that will inevitably be washed away in the next extreme wet year. To this day, cities sprawl onto the floodplains, housing developments pop up in the deltas, and homes are built on the edges of cliffs and canyons where landslides occur. Clearly, as Steinbeck indicated, society has collectively "lost its memory" of the Earth's climatic past. The worst flood in recorded history in the West occurred in the winter of 1861-62. This deluvial disaster turned enormous regions of California into inland seas for months. Today, these same regions are home to California's fastest-growing cities. Much can still be learned from that historic flood, since many of the survivors wrote chilling accounts of it. In the next chapter, we focus on the flood of 1861-62, describing firsthand accounts of harrowing events and drawing the lessons we should have learned from this catastrophe. B. Lynn Ingram is Professor of Geography and Earth and Planetary Science at the University of California, Berkeley. Frances Malamud-Roam is an Associate Environmental Planner and Biologist at Caltrans, and visiting scholar in the Department of Earth and Planetary Science at the University of California, Berkeley. 4. Why Is Climate So Variable in the West?